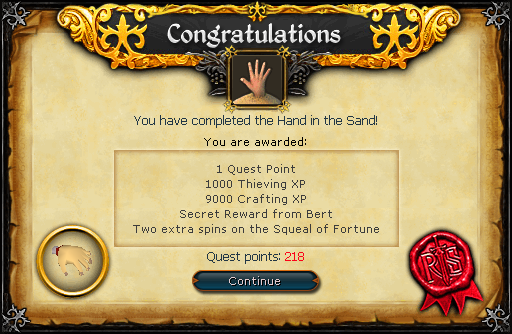 A severed hand has appeared in Bert's sandbox located in Yanille. How did it get there? Can you solve the mystery and find out what happened? 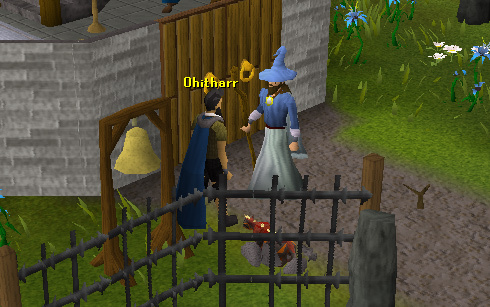 Begin by speaking to Bert, who can be found just north of the pub in Yanille. Bert is located in a building just to the east of the house portal in Yanille. To get there, you can use the Fairy Ring code CIQ, use the Yanille lodestone teleport, use the Watchtower teleport or have your house set in Yanille and teleport to it. He found a hand in his sandpit and now he doesn't know what to do. You offer to lend a hand. Now head south to the pub, in which you'll find the Guard Captain. If you haven't got a beer, you can buy one off the bartender for 2 coins. You hand over your beer to the Guard Captain who drinks it in one large gulp. You'll then give the hand to him, but he will be drunk enough to drop it in his beer. He then suggests to get help from the wizards. Head east to the Magic Guild and ring the bell at the entrance. Zavistic Rarve will appear and on closer examination will declare that the hand belongs to Clarence, one of his students. He charges you with finding out why Bert has been working long hours recently. 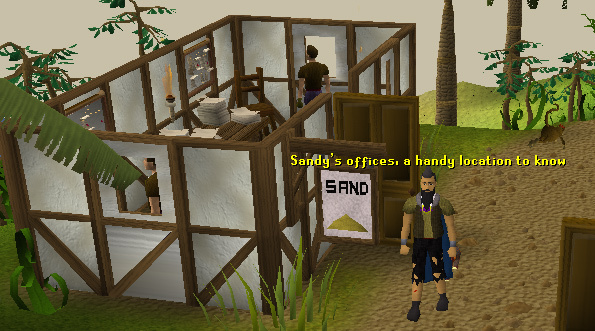 It turns out Bert works for Sandy from Sandy Sand Corp, and hauls sand from them in Karamja to his sandpit. He believes he hasn't been working any different hours than usual. Now you'll need to head over to Brimhaven. Sandy's office is located just south of the restaurant. Search his desk and you'll find the original copy of Bert's Rota and find out he has been working much longer than he should be. Put a pair of gloves on and pickpocket him until you get some sand, which you'll need to keep. Head back to Bert in Yanille and show him that he has been working longer hours. He's confused because he doesn't remember a change, but he believes that it's to do with the wizards from the Magic Guild and the strange scroll that appeared a week ago. Head back to the Magic Guild and ring the bell to make Zavistic Rarve appear again. You'll show him the scroll and he'll tell you it's part of a mind-altering spell. He gives you a magical scrying orb and tells you to talk to Betty in Port Sarim about some Truth Serum. This is where you'll need two vials, some redberries and whiteberries, as well as a lantern lens. If you have all the items, speak to Zavistic again and he'll offer you teleport you to Betty in exchange for an empty vial. Accept and you'll teleport to Betty's shop. Talk to her about the quest and she'll explain how to make a rose-tinted lens. Once you've made it, talk to her again and she'll put a vial on the desk. You need to stand in the doorway and use the lens on the vial. Talk to Betty again and she'll ask for something personal of Sandy's. If you still have the sand from his pocket, then Betty will take it and add it to the serum. Now you'll need to head back to Sandy in Brimhaven. Activate the magical scrying orb, then talk to him. Choose any option to distract him, then use the truth serum on his coffee. When you've done that, talk to him again. He'll explain that he hired a wizard (Clarence) to put a spell on Bert to make him work for longer hours for the same pay. He then killed Clarence so that no one would know and so that he wouldn't have to pay him. Head back to Zavistic and show him what happened. He asks for five Earth Runes and a Bucket of Sand. Once you give these to him, a cutscene will ensue in which he casts a spell causing the sandpit to magically refill. 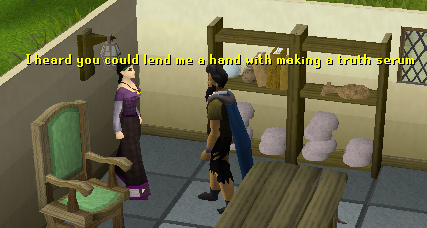 He then asks you to go to the Entrana sandpit and check for any remains of Clarence. Once you get to Entrana, head west until you find a sandpit and a monk called Mazion. Talk to him and he'll give you a head (if you lose it just talk to him again). Take the head back to Zavistic and quest complete!